My first jQuery Plugin.. A 4KB jQuery plugin instead of a 118KB Google Blog Bar!! 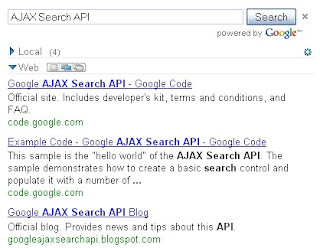 The Google AJAX Search API provides simple web objects that perform inline searches over a number of Google services (Web Search, Local Search, Video Search, Blog Search, News Search, Book Search, Image Search, and Patent Search). It is an old news that: The API exposes a raw RESTful interface that returns JSON encoded results so it would be easily processed by most languages and runtimes.